Pencils Down, Pass the Remote: Does "Glee" Have a Race Problem? Does "Glee" Have a Race Problem? The other day, after watching Glee's unnecessarily long, but nonetheless fairly entertaining, "Born This Way" episode. While perusing Facebook after finishing the episode, I noticed a comment from an esteemed former Phoenix colleague, who asked why, in an episode devoted entirely to self-image and personal struggles, the series' lone black character barely appears, and certainly has nothing remotely resembling a storyline. 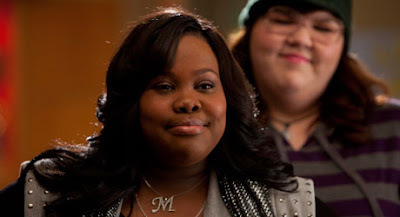 In fact, Amber Riley's Mercedes has only had one storyline in the entire second season, and that storyline focused on the character's attempt to bring tater tots back to the McKinley High cafeteria, so I'm not sure it even counts. Vanity Fair's Brett Berk expressed similar feelings in his recap: "But what about Mercedes? Don't tell me she's without struggles of self. Nothing personal against Lauren Zizes, but is it a coincidence that they brought on a heavy-set white-girl diva who can't really sing a few weeks back, and she's now had more line and plotlines than Mercedes has in two years?" I have to agree with Berk; while I also enjoy Ashley Fink's Lauren - she and Puck are the only couple on the show I can currently stand - it is largely because of her plotlines, and those given to Darren Criss' Blaine, that we've barely seen Mercedes this season. Now, I've never been reticent about criticizing Glee, whether because of the show's inconsistent handling of its gay storylines, or because of the way in which the writers seem to forget about both stories and the basic personalities of the characters from week to week. However, the show's handling of issues of race is the weakest point in a series with many, many weak points. Creator Ryan Murphy's focus on themes of homosexual oppression is admirable, although sometimes poorly executed, but the way in which the show completely ignores issues of race is disturbing. For some perspective on the racial issues that plague Glee, we can take a look back at the (very few) black characters other than Mercedes who have appeared at any point in the show's two seasons. To my count there have been four: Matt Rutherford, better known as the other football-playing dancer who abruptly transferred at the beginning of this season, and who I just had to IMDb because he was so utterly forgettable; Azimio, Karofsky's friend who apparently doesn't get both a first name and a last name; Eve's Grace Hitchens, rival show choir director; and some of the girls of the Jane Addams Reform School, one of the New Direction's competitors at sectionals last year. So, to recap; in addition to Mercedes, whose character mostly consists of a stew of sassy black diva stereotypes, we have two football players, one of whom is also a dancer, a tattooed choir director, and a group of juvenile delinquents. It would appear that Glee is not even trying to present any sort of insightful portrayal of black characters and their issues. Which brings us back to Mercedes and "Born This Way." I don't know if Murphy and the other head writers, Ian Brennan and Brad Falchuk, are simply too focused on other storylines to address issues of being black, or if these three white men are simply unable to identify with the struggles of a black woman, but it's clearly something that needs to be discussed. As a white girl who grew up in a city that was just about as white as Glee's fictional Ohio locale, I know that the issue of race is extremely fraught in that kind of environment. Murphy has, despite the incredibly inconsistency of the writing and characterization on Glee, started a positive dialogue on the subject of homosexuality and the bullying that plagues gay teens. If he chose to hire a black writer and really tackle the subject of race, he could do the same thing for racial issues. And now, to remind us all of why exactly Mercedes deserves some new storylines, pronto, I present her scintillating duet with Santana Lopez on the Tina Turner classic "River Deep, Mountain High." Enjoy! I totally agree! Mercedes is one of the best singers on the show and could be one of the most interesting characters as well if we only could know more about her. The show is doing itself a huge disfavor by not showcasing her talents more.